Flipping through Khun Chawadee’s book Bangkok’s Top 50 Street Food Stalls, I got an itching to try the Khao Mok Gai vendor on Soi Convent. 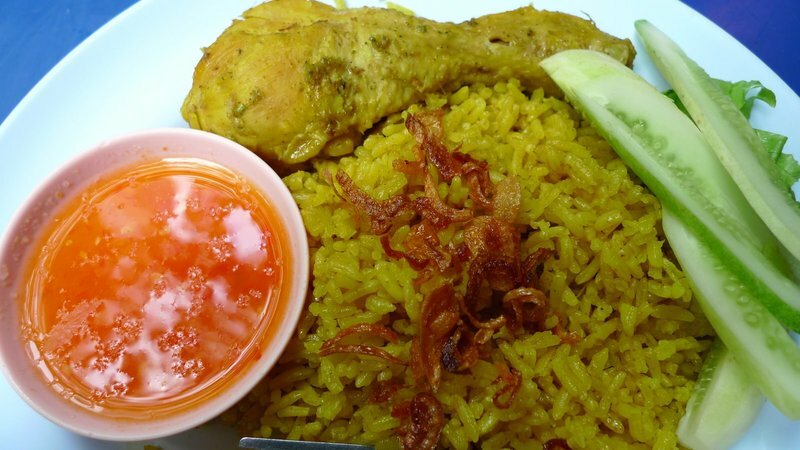 Khao Mok Gai, which alludes to a mountain of rice burying chicken, is the Thai take on chicken biryani. Doubtlessly Indian in origin, the dish traces its more recent roots to the predominately Muslim south of Thailand. It is a dish that is simultaneously simple and complex, one that rarely fails to satisfy. The vendor in question has long been a fixture on the sidewalk along Soi Convent, just off Silom Road. 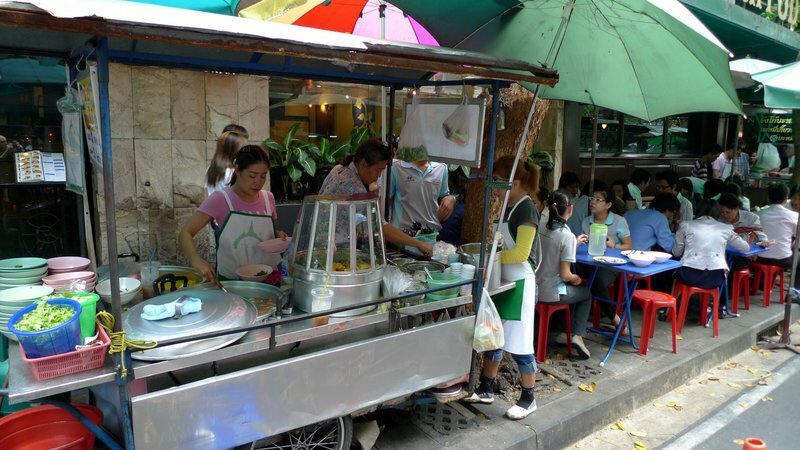 Just down from the Starbucks and in front of an Irish Pub, the khao mok gai vendor’s cart perches on the edge of the curb with a half-dozen folding tables and plastic stools set out beneath umbrellas. The menu is rudimentary. 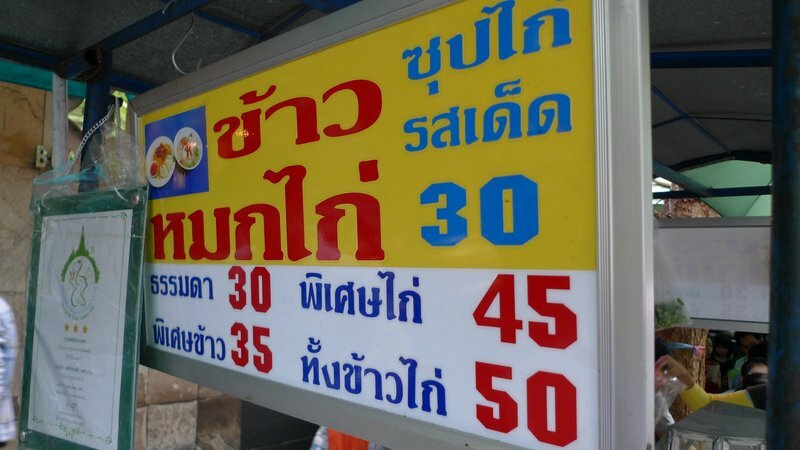 The khao mok gai comes in three ways: regular for 30 baht (US$1), rice special (extra rice) for 35 baht, chicken special (extra chicken) for 45 baht, or double-double for 50 baht. The dish is not fancy – a piece of chicken with a heaping pile of turmeric-stained rice. Fried shallots and cucumber slices garnish and a dish of sweet chili sauce is on the side. The rice is tasty and the chicken flavorful, though. Don’t skip the soup, which comes on the side. 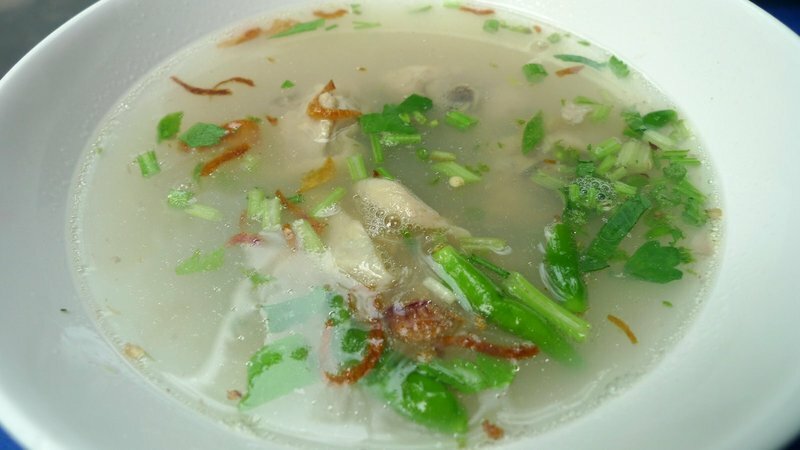 Made with bits of chicken, herbs, and fried shallots, they serve this plain or spicy and its rich flavor hits the spot. Like all street vendor places worth their salt, this cart gets very busy at lunchtime and they make their day’s wages or so. Don’t dilly-dally. Eat your food, pay your tab, and get moving! For an alternate (and Xangan) version of biryani, check out this video I made about a visit to the kitchen of Dr. Zakiah back in 2009! This entry was posted in Uncategorized and tagged Bangkok, Biryani, chicken, Convent, food, gai, In, khao, Krungthep, Mok, rice, Silom, Stall, street, vendor by christao408. Bookmark the permalink. That’s a quick and simple bite for lunch, I suppose? The rice sure looks quite delicious! The food looks good and the ambiance interesting. Looks tasty – but what is the curly stuff on top the rice?? @murisopsis – Fried shallots. @oxyGENE_08 – Oh, yes… there’s plenty to do here but “EAT” is a great answer. @Fatcat723 – “Interesting” as in “fascinating” or as in “that’s a lousy place to eat”? =D@CurryPuffy – True fast food. But freshly made, preservative free, and healthy. Interesting as in I would certainly eat there! I am a people watcher and that is prime territory. Just keep feeding me tea. Sometimes the best food is the non-fancy version! Case in point the dish you showcased. Looks pretty great to me! @brooklyn2028 – That’s true. Quality ingredients, simply prepared. @AzureRecollections – I used to feel that way when I lived in the US, too. If big cities in North America had this type of fast food, there wouldn’t be nearly as many issues with obesity. @Fatcat723 – The only problem is, if you watch the people too much and don’t finish your food quickly enough, you’ll get a tongue lashing from the vendors. Quick turnover is their game.